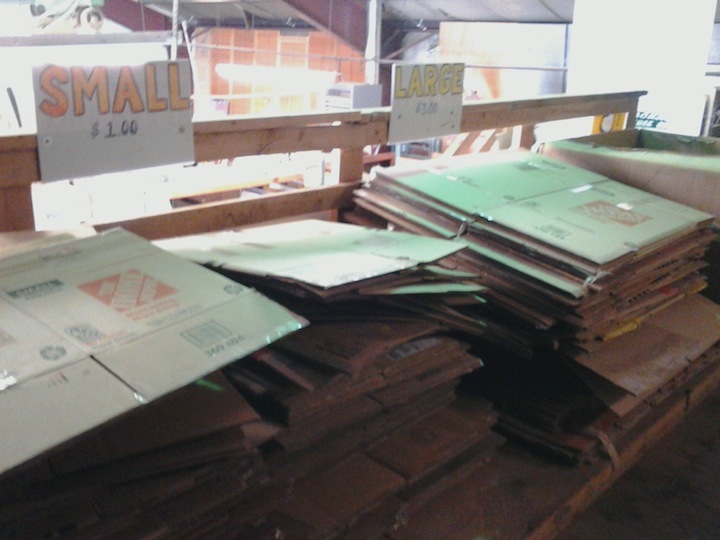 We collect and re-sell moving boxes and packing material. Materials can be picked up or dropped off upstairs, above the office (stairs are located just inside the Warehouse). Any moving box in reusable condition. They should be broken down and stacked neatly by size. Packing peanuts and bubble wrap. These materials are available for re-sale. To purchase, please collect what you would like to take and then pay inside the Warehouse or office before loading it into your vehicle. Boxes are priced by size: Sm $1: Med $2: Lg $3: Dish Pack $4 : Mirror Pack $2 : Wardrobe $7 (includes rack). Peanuts and bubble wrap are $2 for a full garbage bag. Please note: Boxes that are not in good condition can be recycled with all other cardboard. Torn or popped bubble wrap can be recycled with plastic bags. 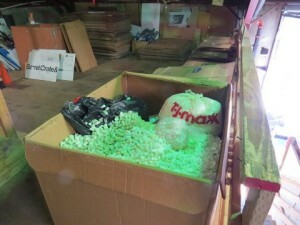 Packing peanuts are not otherwise recyclable.